Not a day passes in any country where arsonists don't walk out of trial courts astonished they were found "not guilty." Not a day passes that property insurance carriers worldwide aren't forced to pay criminals who set, or had their businesses or property set on fire. Analyzing these failures often returns to a single fact-the samples taken by fire investigators from suspicious burn patterns in buildings and motor vehicle fires came back from the laboratory "negative." With confirmation of the presence of ignitable liquid residue the fire's cause very often becomes a battle of experts with one side struggling to establish an intentionally set fire and the other claiming the same peculiar burn patterns are the result of flashover phenomena, falling burning debris or some other perfectly innocent explanation. In arson cases, the trial court judge and jury often know something is wrong with the fire but there just wasn't enough evidence to "prove it." In these cases and thousands of others, justice is derailed when juries acquit or prosecutors or the investigators themselves decide not to file charges because their samples were "negative." In many, perhaps most of these arson cases, the tables could have turned if the fire investigator knew how to take expert quality samples. This includes expertise of the identified ignitable liquid accelerant and their sampling process. In some other cases, unusual burn patterns may have lead investigators to incorrectly conclude an incendiary fire and discount the lab analysis that correctly tested negative. Truthfully, there is no real debate about whether the bar needs to be lifted significantly on the quality of evidence collection at fire scenes. It is obvious. There is no dispute about another thing: of the approximately two million fires reported by American fire departments each year, a full quarter-five hundred thousand fires, are estimated by leading government, NFPA and property insurance industry sources to be intentionally set. Worldwide, it has become a cliché that when someone decides to use fire to even a score with an enemy or competitor or cash in the fire insurance policy the first thing reached for is "gasoline." 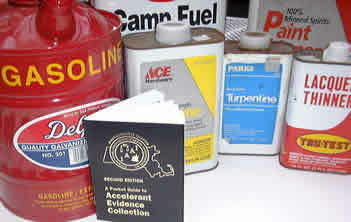 Whether it's a scene ignited by a "splash and dash" or "plant and trailer" the fire investigator needs two highly developed skills; the ability to search a scene for the unique damage patterns associated with burning ignitable liquid use and, when found, the ability to expertly take evidence samples from the patterns on any floor or contents present. To be consistently successful at the fire scene and in the witness chair requires mastery of specific skills and a body of information. Most of us understand (or have witnessed) the damage done to an otherwise competent investigation when the investigator on the stand can't provide a basic definition, specific fact or explanation for a common term or item of evidence. Explosive Limits (flammable limits) - The extreme lower and upper concentrations of an air/gas mixture in which combustion or deflagration will be supported. Generally, fuels with broad flammable/explosive limits such as acetylene (2.5% to 80% by volume) are considered more hazardous. Acetone - (dimethyl ketone, 2-propanone), (C3H6O), flash point -4° F (-20° C); ignition temperature 869° F (465.4° C); explosive limits 2.6%-13.0%; vapor density 2.0; specific gravity 0.792; toxicity (3). A volatile, flammable, colorless, liquid ketone having a fragrant odor and miscible with water, alcohol and most oils. Principal uses are as a solvent in lacquers, varnishes, cosmetics, nail polish remover and in the mixture of other solvents. Understand that if you are going to work in this field there are skills and information that you must possess. A Pocket Guide to Accelerant Evidence Collection has been recognized as a leading resource in the specialized field of fire pattern recognition associated with ignitable liquids and expert arson debris sampling procedures. First published in 1992, this unique how-to manual is the result of ten years of exhaustive research of the standards in this field, live fire experimentation and collaboration by a select team of experienced fire/arson investigators, fire scientists and forensic chemists. The revolutionary interFIRE VR CD-ROM fire/arson investgation-training program released in 2000. The Pocket Guide to Accelerant Evidence Collection, 2nd Edition is nearly 50 percent larger and contains many new sections and up-to-date revisions of the earlier edition. Thirty "symptoms" that may indicate ignitable liquids were used to start or propagate an arson fire. Ten major physical properties of the twenty most common flammable/combustible liquids used as fire accelerants. The best places to take ignitable liquid residue samples and the sampling locations to avoid. How to prevent cross-contamination of your samples by your tools and safety gear. The most effective sampling methods for each of the seven com- mon floor surfaces. How to load evidence containers for best results with today's GC/MS analysis instruments. Physical and chemical properties for twenty common ignitable liquids used as fire accelerants. A glossary of fire and arson terms. A concise listing of tools needed for arson debris sampling and scene documentation. Vital information on an investigation protocol that has proven successful in increasing arson case clearance (arrest) rates and also arson debris sampling. With an arson conviction rate standing at approximately 2 percent per one hundred known arsons for at least the past twenty years, arson has earned its reputation as the toughest crime to solve. sources of guidance to the fire/arson investigator such as interFIRE VR and the Pocket Guide to Accelerant Evidence Collection that enable field investigators to perform their work in an expert manner opening the door to dramatically improved investigation results. A Pocket Guide to Accelerant Evidence Collection, 2nd Edition will play a role in this improvement. To learn more about the manual go to the website at www.maiaai.org or send your name and address with a check or money order for ten dollars to Pocket Guide, P.O. Box 364, Brimfield, MA 01010 (USA) to receive a copy postpaid. Orders from outside the U.S. must send eleven dollars in U.S. funds to help defray mailing costs. There are significant discounts for bulk orders. This article doesn't necessarily reflect the views of American Re-Insurance Company. Robert Corry is an Assistant Vice President and Fire Investigation Specialist in the Property Claims Division, based in American Re's Hartford, Connecticut office. Bob's responsibilities include consulting with clients on arson and fire loss claims and providing educational programs on arson investigation and defense, and underwriting against arson. Bob served on the Massachusetts State Police from 1974 until his retirement in 1997. From 1982 until 1997 he was assigned to the Massachusetts State Fire Marshal's Office (SFMO). Bob was a fire and arson investigator assigned to the Hampden County District Attorney's Office for 10 years conducting fire, arson and bomb investigations in 26 communities, and was Detective Lieutenant and Commanding Officer of the statewide SFMO Fire, Arson and Explosion Investigation Unit, the largest unit in the state police, from 1992 until 1997. In addition, Bob was an Accelerant Detection Canine handler from 1990 until 1992. Bob has been the principle developer of arson training programs and publications, including the Pocket Guide to Accelerant Evidence Collection. In addition, he lectures on fire/arson investigation, interview & interrogation techniques, and criminal investigation techniques to the Massachusetts state and local police and fire academies, the National Fire Academy, and the FBI National Academy. A member of the Massachusetts Chapter of the International Association of Arson Investigators, Bob served as the group's Vice President in 1987 and President from 1988 until 1990. He is also a member of the National Fire Protection Association. Bob earned a Bachelor of Science in Criminology from Northeastern University and a Master of Science in Criminal Justice Studies from American International College. He served the U.S. Army from 1966 through 1970, where his last assignment was Captain, 173rd Airborne Brigade in Vietnam.